While many of us have updated to LCD screens, CRT monitors are still alive and well and you may be using one daily for your work or personal use. One fairly common issue for CRT monitors is flickering. This flickering can lead to eyestrain, fatigue, and headaches so it is best to eliminate or reduce your CRT monitor’s flickering to a minimum. Read on to learn how to fix a flickering CRT monitor. If you are having trouble with an LCD monitor that is flickering check this article. These instructions will not work for an LCD monitor. Although the information displayed on your screen may seem static, the fact is the information is constantly updating. Much like how a filmstrip moves quickly to make it appear that images on the movie screen are actually moving, your monitor is constantly updating what it displays to give the perception of motion. The speed at which your monitor updates is measured in Hertz. One Hertz is equal to one cycle per second. This is the same Hertz found in the measurement of computer processor speeds. A 2 Gigahertz processor is capable of operating at 2 billion cycle per second. However, if your CRT monitor is set to an incorrect refresh rate, it can appear that the screen is flickering. Luckily, there is a fix that usually makes the flickering go away. To stop your CRT screen from flickering, you need to change the rate (Hertz) at which your monitor refreshes. To do this in Windows 7, begin by clicking on Start>Control Panel>Display. This will bring up your computer’s display settings. On the left hand side of the display settings window, click on Change Display Settings. Locate the link in this window titled Advanced Settings and click on it to open the properties windows for your monitor and video card. Click on the monitor tab. Here you will see a drop down menu titled Screen Refresh Rate. Using this menu, you can change the rate at which your monitor refreshes the screen. Notice that the refresh rate is measured in Hertz or, again, cycles per second. In order to correct flicker, you should set the refresh rate to at least 75 Hertz. Change your monitor’s refresh rate using the drop down menu and click the OK button. Windows 7 will ask you whether you want to keep these settings. Don’t worry if your screen becomes unreadable when you change the refresh rate. In 15 seconds, Windows 7 will resort back to the original refresh rate as long as you don’t click the OK button to accept the change. If all goes well, you should experience no more flickering of your CRT monitor. 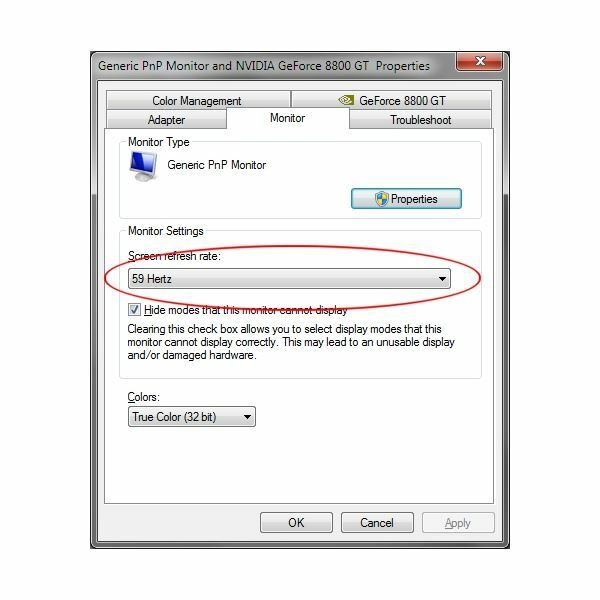 There is an option you can uncheck titled Hide Modes That This Monitor Cannot Display. If you uncheck this box, you may get many more refresh rates from which to choose in the drop down box. However, unless you know what you are doing here, it is wise to keep this option checked. It is technically possible to damage your monitor by forcing it to display a refresh rate that it cannot handle.